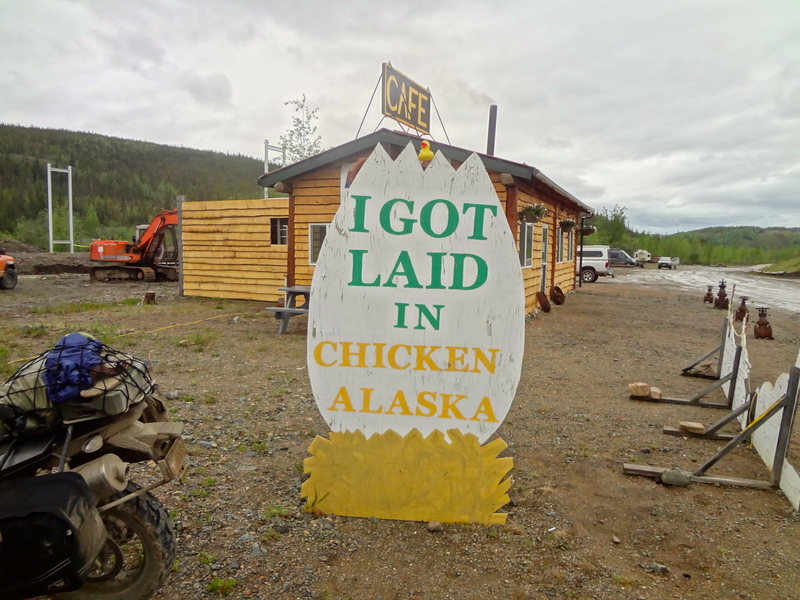 Chicken, Alaska? Is this really a town? Eider, are you sure? Yes. 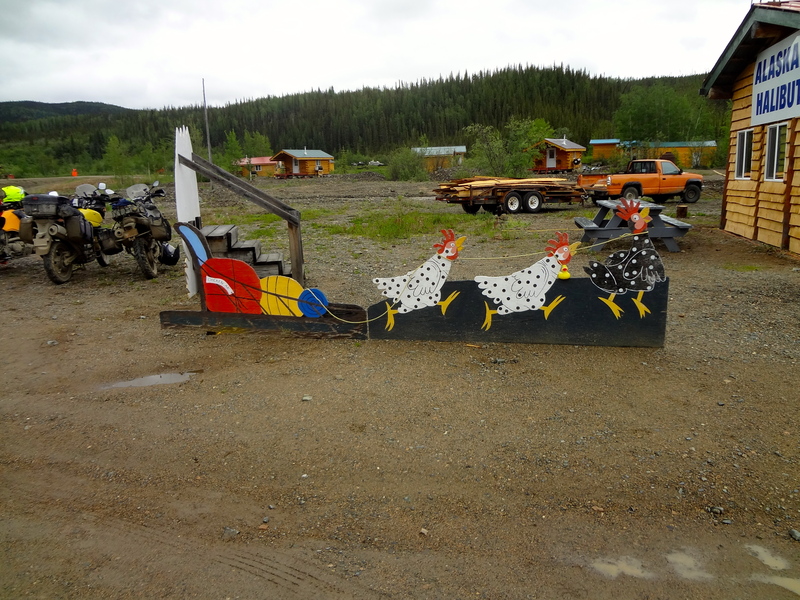 Chicken, Alaska is a very small town not too far from Fairbanks, Alaska. 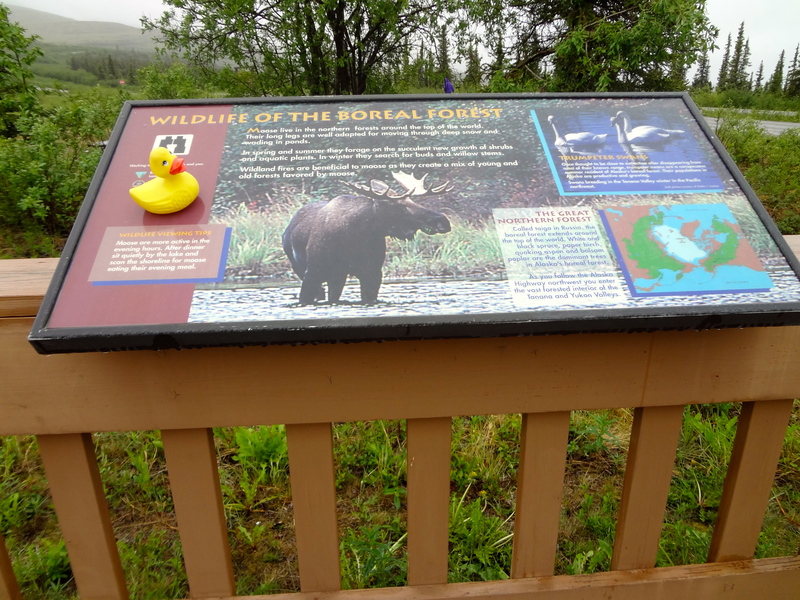 Approaching the town, Eider stopped to read this information about moose. Often Eider has moose in his yard in North Pole near Fairbanks, Alaska. 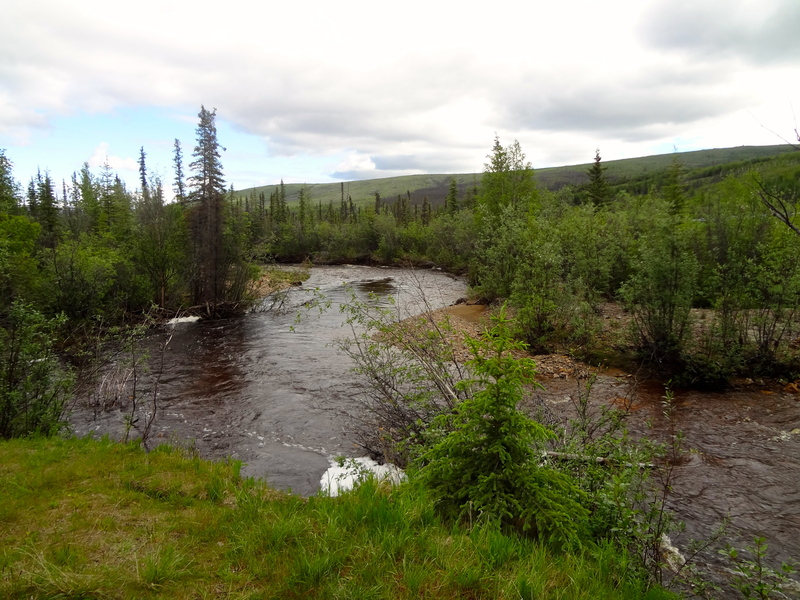 The area was settled by gold miners in the late 1800s. In 1902 the local post office was established and the community needed a name. There were many ptarmigan in the area. Ptarmigan are small birds, smaller than a chicken. 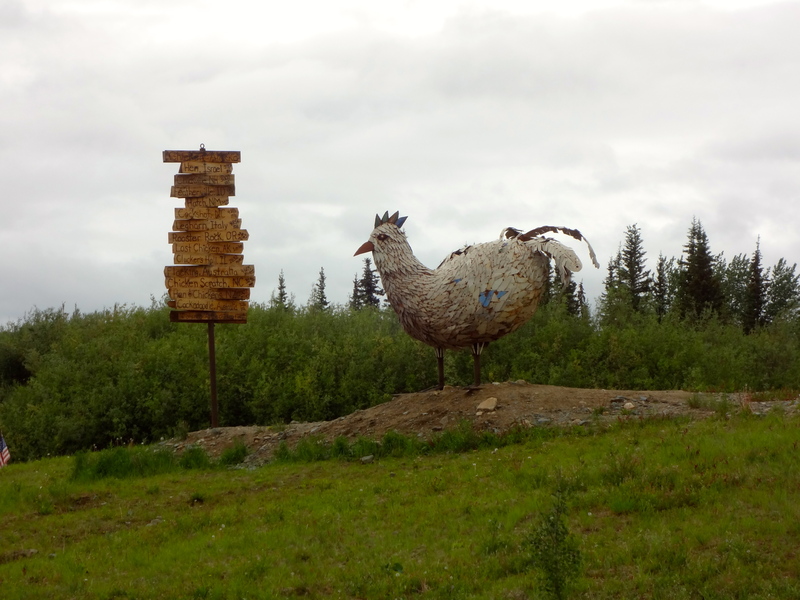 Some wanted to name the town ptarmigan, but the unusual spelling of the word, convinced the miners to name the town Chicken instead. 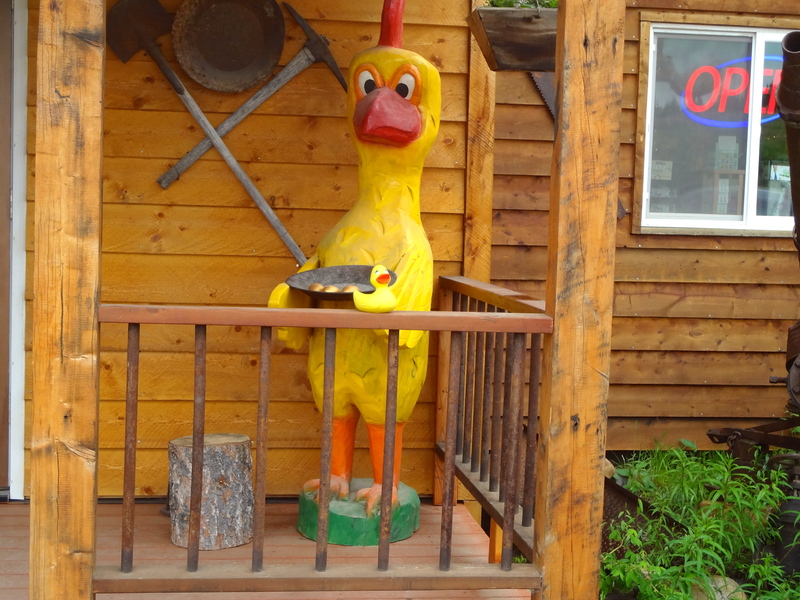 With a name like Chicken, tourists arrive here, so the town gives them something to see. 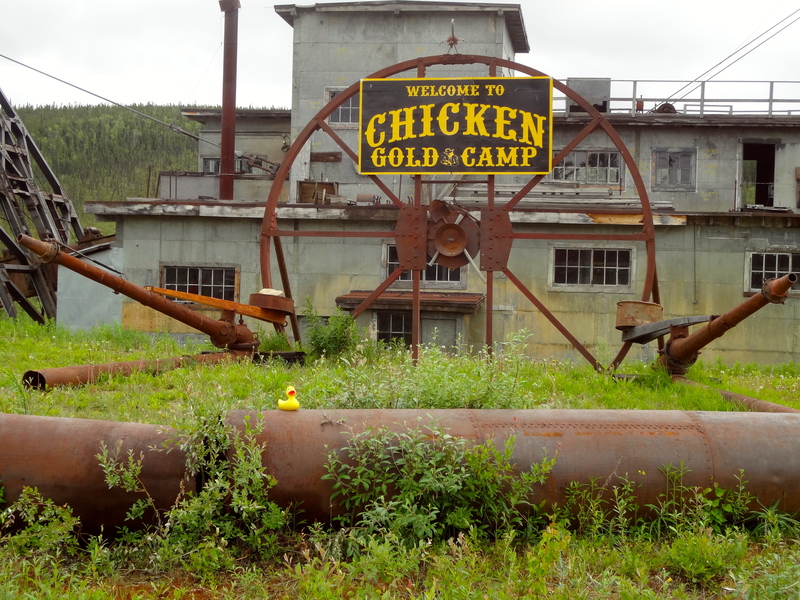 Some old buildings are still standing in Chicken. Some of the buildings and Dredge No 4, Pedro Dredge, are listed on the National Register of Historical Places. 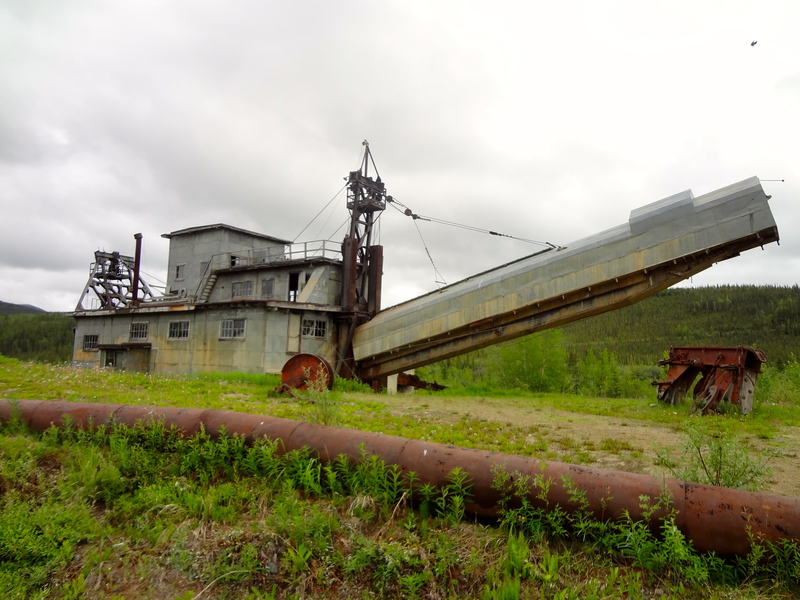 There are still active gold mines in the area. Chicken had a music festival. This is the stage for many of the musical groups. 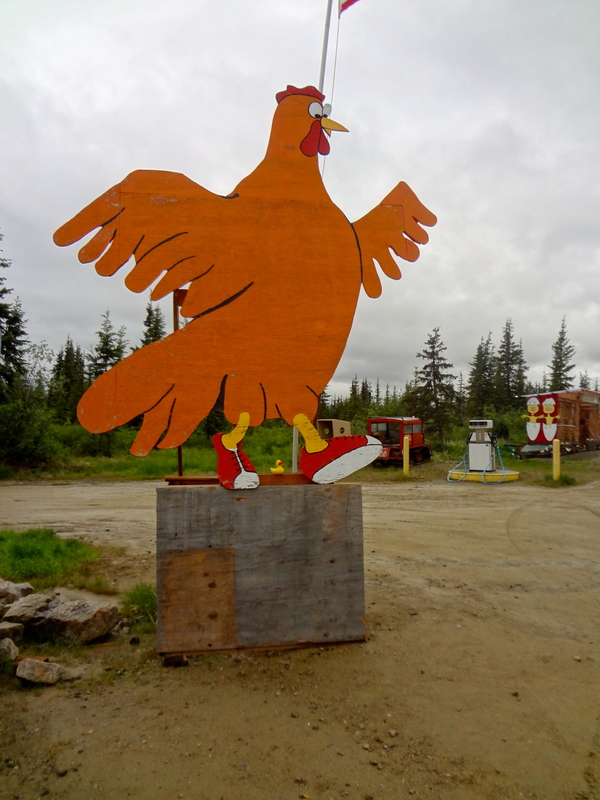 Tourists have fun in Chicken, Alaska. That chicken is reading signs to different places. Eider Duck is my cousin and friend. When Eider was leaving Chicken, he stopped at this phone booth to call me. Eider tried to call me, Zeb the Duck. 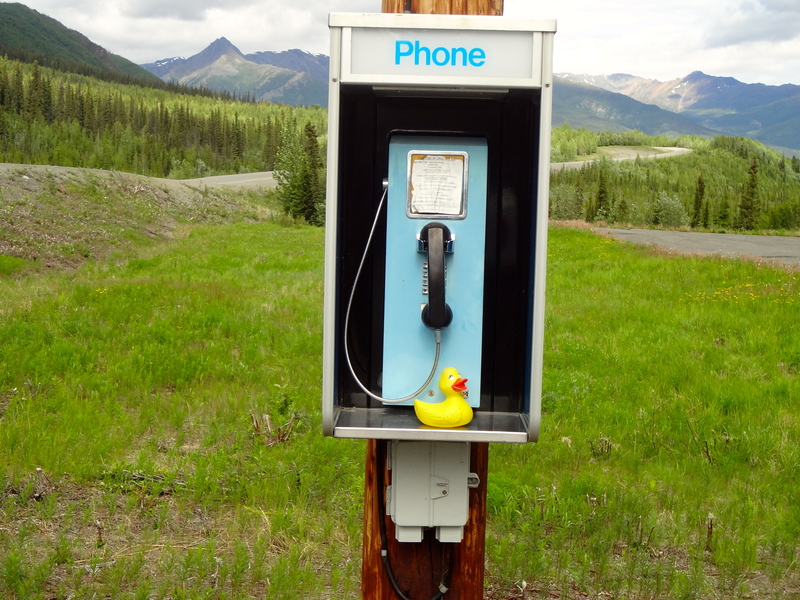 This is a working telephone, but I, Zeb the Duck, was not home when Eider called. Maybe Eider will try to call again. The road and river in and out of Chicken is really pretty. Eider says they have forest fires in Alaska, like every place else. 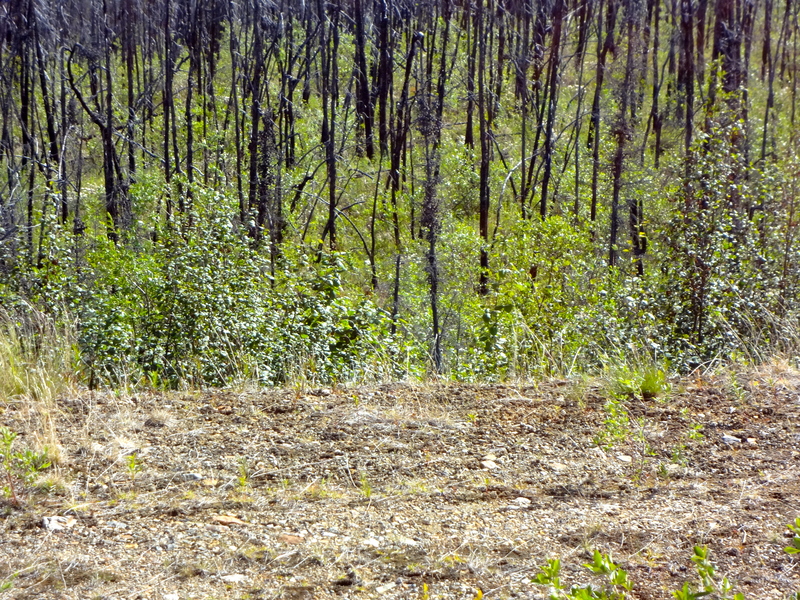 This is the new growth from a fire about 5 years ago. Growing back from fire 5 years ago. Eider says the animals like to eat this new vegetation. This is really a great town Eider. Thanks for sending us all these pictures. 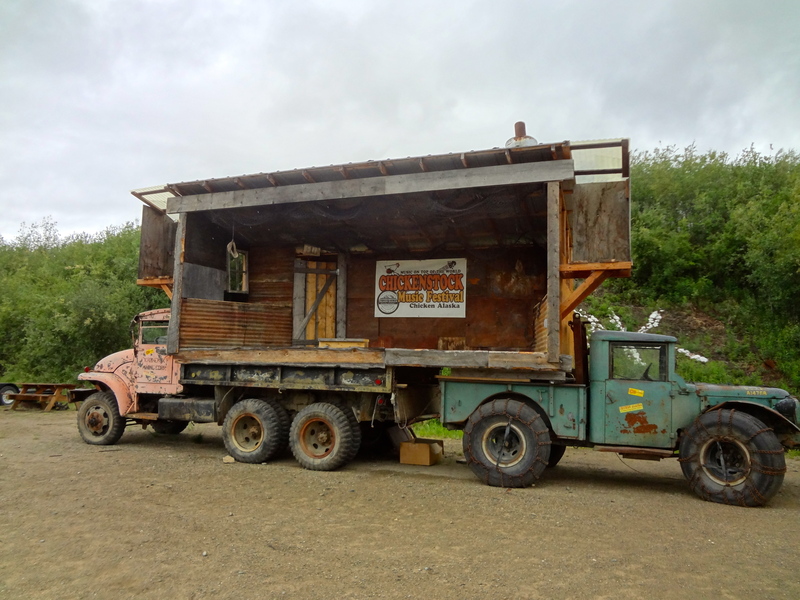 This entry was posted in Alaska, Uncategorized and tagged Alaska, Chicken, Colorado Traveling Ducks, gold mining area, Pedro Dredge. Bookmark the permalink. The people who live in Chicken must have a great sense of humour. I am sure that have to be able to laugh. Must be a fun place to be. Thanks for reading and commenting.